The ancients trusted this “heart stone” to awaken the very Spirit of Love that abides in all souls. Rose Quartz opens wide the Heart Chakra so that we can welcome adoration into our lives – giving and receiving love without fear and find the contentment that is our truest nature. This beautifully colored healing crystal imparts kindheartedness and comfort to those who feel broken inside. She instills a sense of what Divine love must be like on a Higher Level. Exchanged between family and friends Rose Quartz creates an energetic bond as firm as those of blood ties. Where her Clear Quartz brother basks in the spotlight, Rose Quartz is content to be supportive and nurturing in this on-going cast of sacred stones. 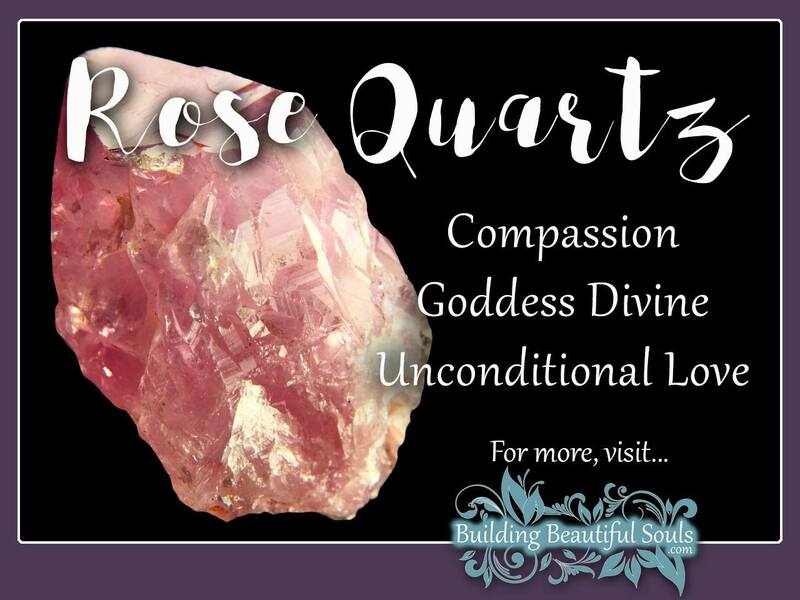 The numerous myths about this healer and teacher give us a little more insight into Rose Quartz symbolism, meaning and overall metaphysical qualities. Starting in Greece we find Aphrodite saving Adonis. When she went to intervene she cut herself on a thorn bush (perhaps even a rose!). As her and Adonis both bled, the drips stained white quartz. Not surprising both the Greeks and Romans associate this mystical stone with love – but it is not the kind of love that burns itself out. Rather, the Rose Quartz spirit sings sweetly of the gentle love between friends, parents and children and couples who walk the Path of life for many, many years. In reading all this you might feel that Rose Quartz is fragile compared to her brother (Clear Quartz – whose properties are used to “amp up” or “energize”), but nothing could be further from the truth. Don’t her let the delicate pink color fool you. After all, what is more powerful than love? Rose Quartz carries great might in a kid glove. When you’re around people with self-seeking attitudes that completely ignore the needs of others, Rose Quartz vibrates nearly audibly. The message it sends is very poignant: Love is always greater than hatred; love overcomes. One of the greatest gifts from this mystical crystal is the ability to love yourself. When you look in the mirror the Rose Quartz spirit whispers: you are beautiful; you are loved; you are DIVINE. This very same voice is one often heard by artists and musicians who illustrate love in pictures and words that move us to our toes. Also, practitioners of Feng Shui recommend using Rose Quartz in the bedroom, in children’s rooms or more traditionally in the Southwest area of the house to protect relationships. In a divination system a Rose Quartz stone represents the need for forgiveness be it toward others or yourself. This precious Spirit reminds us that we are all human and prone to error, but mercy truly is powerful and Divine. Seers strongly attuned to Rose Quartz tell us that this healing crystal seems to like being “close” to its owner. That way it can interact intimately with your auric field (think snuggling with a good friend). Wear or carry a Rose Quartz to stimulate and protect your heart chakra. Because of its associations with love and matters of the heart Light Workers often recommend the shape of a heart for continuity. Rose comes from the Latin term rosa, alluding to the Queen of all flowers that also represents love: the Rose. It is interesting that in Europe the term “sub rosa” (under the rose) meant confidentiality and secrecy. A rose or rose carving appeared over many meeting tables and in gardens where lovers could meet without peering eyes. This tells us the Rose Quartz isn’t a tattle-tale. This healing stone will honor those private moments between lovers and friends with the greatest of trustworthiness and expect you to do likewise.